From Suann: I started simplesong design almost 10 years ago. 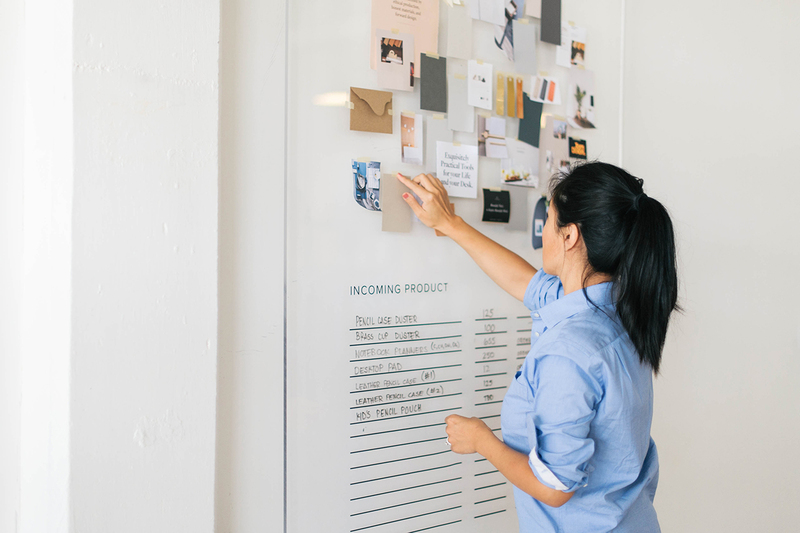 It started as an invitation and paper design studio, and then evolved to a branding studio. Over the years the design studio grew and I’ve been really fortunate to work with some amazing companies and brands. I still work with a few long-time clients, but most of my time is dedicated to Appointed. As a graphic designer at heart, much of my work begins and ends on paper and I was always on the search for simple, well-made and functional paper and office supplies. After seeing a need in the market for American-made products, I decided to make my own and that’s how Appointed came about! I took about a year to design the brand, prototype products, research manufacturing partners and develop the business plan. My years of marketing (prior to starting simplesong), designing for others, and working with paper all contributed to the development of Appointed. For a year we subleased a tiny 100 sq ft space from one of our printers. We eventually outgrew that and moved into our dream 3,000 sq ft office in Ivy City in the District of Columbia. It was a big but necessary jump for our growing company and we’re already getting close to outgrowing the current space which serves as a product showroom, work space for our design and operations team, and fulfillment center. We love being located in the District and it’s a huge part of our identity. The DC community has been so supportive of us and is a big part of our growth. We’ve gradually grown to five full-time staff, seasonal part-time help and occasional contractors. We’re a small but mighty team that manages over 400 wholesale accounts, an e-commerce store, custom product development in addition to product design and brand development. I’m really fortunate to have a team that loves this company and its products as much as I do and I attribute our growth to our amazing team. Each of our team members have very distinct roles so their days vary depending on their role. But we also very much work as a team and when we have a large project or deliverable, we always have an all hands-on-deck mentality. It makes for a great team environment. My days definitely vary but I try every day to dedicate time to certain necessary functions, generally in the following buckets: general operations, managing our team, designing and and product development and marketing. How I spend my time has definitely changed since we first launched 2+ years ago. A lot of my time is now spent on strategy and business operations like managing cash flow, personnel management, and our larger brand and marketing strategy. My goal for this company from the very beginning was to be a national brand and a leader in our space but we have a long way to go. I’m always thinking and working towards that long-term goal. But at the same time, I love product development and designing so I try to carve out as much time as possible for that function. Even though our products vary (from leather accessories to paper goods) our design process is usually the same across product categories. The product development process is fun but definitely takes time. We’re constantly fine-tuning each of our products to see how we can make better or more efficiently. If we don’t have an existing manufacturing partner we research and vet potential partners. Sometimes this is the most time-consuming part as it can be challenging to find a US-based company willing to work partner with us to make what we’re dreaming up at the price point and quality we need. Product design — we usually design many, many versions until we come up with the perfect design. Prototype and test the product — we prototype every single one of our products and we’ll test it with our customers and among our staff. We want to make sure what we’re creating is functional and durable. Once we finalize a design we move to packaging development. And finally, we have a marketing plan for each product, which includes product photography, how we’re rolling out the product and sharing among our customers and retailers. All photos courtesy of Appointed.